These are available as kits only. The envelope of this knapsack is heavy canvas, stitched to genuine pure cream-white goatskin. It measures 13" top to bottom by 14" wide. The white latigo straps for the shoulders are 2", ending in wooden "torpedo buttons." 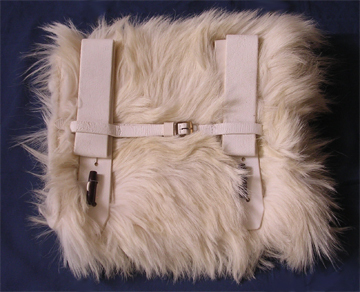 The front has a 3/4" connecting strap with buckle. We provide the canvas bag, straps with buckles attached, goat fur, waxed linen thread and instructions.